Will the Christmas Hammer strike this year? As outlined in Issue 217, the 2010 hammer struck for four days in a row (December 20, 21, 22, and 23) when hundreds of quakes above magnitude 4.7 occurred on the Bonin Arc off Japan. The 2010 hammer started on December 20 with massive global shuddering at approximately 18:00 UTC, when the magnetic N Pole of Earth comes up over the horizon to face the approaching Planet X. The hammer also struck in 2007 for four days in a row (December 19, 20, 21, and 22) when large black seismographs again occurred at the same time each day. Per the Zetas, the hammer is basically a more violent wobble, and plate movement can be anticipated. ZetaTalk Analysis 12/23/2007: What does this increasingly violent daily lurch do to the Earth's plates? Great quakes that affect the globe in its entirety must first occur at one of the brake points in the global mesh of plates. For the Earth, this is primarily the point where the Indo-Australian plate dives under the Himalayas. The Himalayas, the highest mountains in the world, show how often this brake point has been hammered in the past. When this brake point moves, it allows the many compression points in the great Pacific to move. This includes rolling the top portion of S America westward. Mexico moves further west than the Canadian west coast, accentuating the bowing of the west coast we have described. Elsewhere around the world such a strong adjustment creates an opening in the Indian Ocean, which allows Africa to roll toward the void, opening the African Rift further. This also puts pressure on the Arabian Plate, so that it rolls in place, a move which affects all the many fault lines that run through this region. A major adjustment of this type unleashes a series of great quakes, which then subside, as the Earth plates lock into new brake points and hold. Given that we are in the midst of the 7 of 10 scenarios, in the middle of the plate movements the Zetas described way back in 2007, a Christmas Hammer in 2011 is likely to expedite the 7 of 10 movements! Will it be as violent as the 2004 hammer, when the big 9.5 quake in Sumatra occurred on December 26, 2004? Per the Zetas, who are not allowed to give specific warnings on just what will strike at what location, and when, we should be braced for more activity. ZetaTalk Prediction 11/26/2011: The Christmas Hammer is caused in great part by the December switch in Magnetic Trimester which occurs, as we have explained, at approximately December 17 on the Earth calendar. This forces a magnetic adjustment in all magnetic planets, and great stress on the Earth which is locked into a magnetic dance with Planet X. But beyond the switch in Magnetic Trimesters, there is the issue of the ongoing 7 of 10 scenarios. The plates are loosened up, such that plate movement in total is occurring regularly. They are greased and ready to slide! What happens when additional stress is placed on the rock fingers along the plate borders, additional jerking around due to a change in the magnetic neighborhood? Certainly, it won't be a calm time. The 7 of 10 scenarios will at a minimum be expedited. Has the wobble become more severe? Certainly the hurricane force winds striking the North Seas on November 24, 2011 and Alberta, Canada on November 27, 2011 would indicate that. The jet stream is often vertical, these past years, due to the wobble. Calgary does not have hurricanes nor does Europe, and this North Sea hurricane was anticipated to beat all records. The violent storm bound for Norway, where you [can] expect one of the worst storm in several years with up to 30 meter high waves in the Norwegian Sea. Southern Alberta has begun picking up the pieces after winds gusting as high as 130 km/h in some places roared through the area. Where these are merely hurricanes, they are in unusual locations, something the Zetas in fact predicted! ZetaTalk Prediction 9/15/1999: Hurricanes will be no more fierce than they are today, but will occur in places not used to hurricanes force winds. 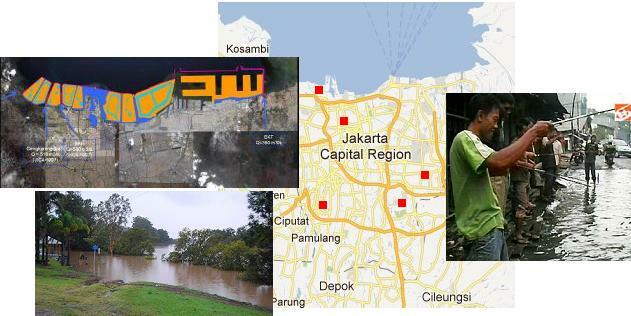 The 7 of 10 sinking in Jakarta, the Capitol of Indonesia, has reached the point where the city has started to evacuate. Jakarta is strugging with rapid sinking, which they have ascribed variously to rain, rising seas due to Global Warming, subsidence in land due to the water table being tapped, sinking due to the weight of buildings, drains trapped by vegetation and garbage, and high tides. Finally, we get some admissions in the press, as the sinking has progressed to where life as usual cannot continue. Building sea walls and pumping water out of the streets can only go so far, though additional huge sea walls are being planned. There won't be time, of course, to turn Jakarta into the Netherlands, though experts have been brought in from the Netherlands. Jakarta residents are catching fish in their streets, and the government is planning to frankly evacuate areas close to the sea coast, or to force everyone to build houses on stilts. Even South Jakarta, in regions almost into the hills, are protesting to their government that they have been standing in water for months. Tambora, West Jakarta turned into a fishing area. Jakarta sees worsening level of land subsidence that the planned development of giant sea wall is now urgent. The engineers from Rotterdam, the Netherlands, will only have two years in setting up the most appropriate strategies. City planning experts have called on the Jakarta government to immediately evacuate low-lying areas in the city's northern coastal region, saying that it could no longer sustain human settlement. Areas like Penjaringan, Muara Angke and Tanjung Priok would continually be inundated by the rising sea water and could no longer sustain human activities. Conditions in North Jakarta are deteriorating quickly. South Jakarta, this morning will go to the office of Komnas HAM. Since last March until now a puddle of water never receded. The 7 of 10 sinking in Bangkok, the Capitol of Thailand, has lawmakers proposing to move their capitol to higher ground. No small move! 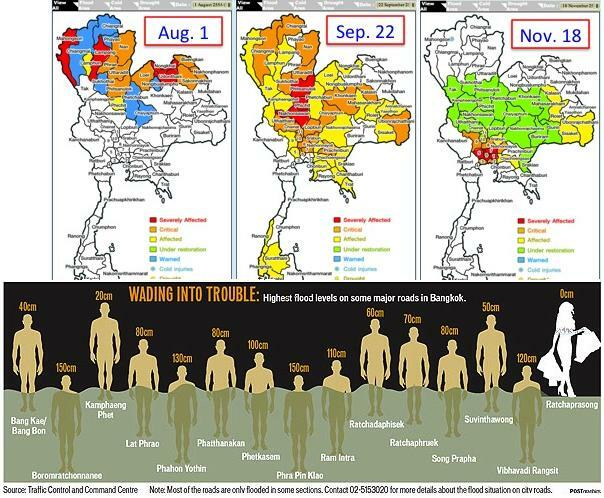 This is an admission that things will not get better, even though the recent floods are mainly from months of flooding in the inland provinces of Thailand, due to the accordion fold of land heaving river bottoms and preventing drainage. Most of the water in Bangkok came from this trapped water suddenly being released. Flood run-offs from Bangkok and other provinces in the Central region are moving south toward the estuaries of Chao Phraya River at a slower speed because there is a mild ocean surge, a water-management expert told a seminar in the capital yesterday. After floods inundated parts of Thailand's capital, lawmakers have submitted a motion to start discussion over shifting the capital city to a safer place. The main alternative options for relocating the kingdom's political and economic heartland were in eastern and northeastern provinces. But sinking is in process, as these photos taken along the coastline reveal!. This is why the water cannot drain, and is mixed with sea water. Meanwhile, crocs and snakes rule the streets. Murky floodwaters are receding from Bangkok's inundated outskirts to reveal some scary swamp dwellers who moved in while flooded residents were moving out - including crocodiles and some of the world's most poisonous snakes. The 7 of 10 squeeze on Malaysia is shown in cracking as the land is crunched and pushed down, the rock bending and breaking and the soil shifting. 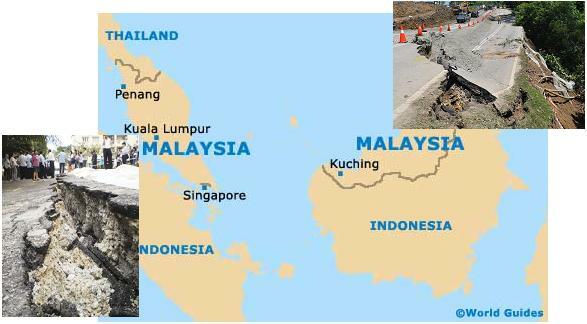 Land cracks appeared in the Malaysian portion of the island of Borneo, and on the peninsular portion also. This could hardly be a coincidence! Disaster struck near Sri Aman town [near Kuching] when the main road linking the town to the state trunk road began to sink. The cracks were as long as 100m. This has never happened before. It did not rain in Sri Aman yesterday. Cracks as long as 50m have appeared on roads near Pandan Mewah Heights [near Kuala Lumpur]. The damage to the retaining wall is believed to be the cause of the cracks. The cracks grow wider by the day. Nearby on the Indonesian portion of Borneo, a huge suspension bridge the size of the Golden Gate Bridge in San Francisco snaped and recoiled, killing and injuring scores of people. It wasn't immediately clear why the 10-year-old bridge collapsed. About 100 people were taken to hospital. A section of the large suspension bridge had fallen into the water. The 770-yard structure - built to resemble the Golden Gate Bridge in San Francisco - linked the towns of Tenggarong and Samarinda in East Kalimantan province. The bridge was built between 1995 and 2001 by state-owned construction firm PT Hutama Karya. And elsewhere in Indonesia, on the island of Sumatra, a coastal bay newly formed, land beneath the new bay having sunk entirely. This is not erosion, this is crumbling land dropping, suddenly, overnight. And on the other side of the island, in the islet for the River Kampar at Riau, a sudden and unexplained tsunami. A new estuary with a width of approximately 700 meters form the post-flood that hit 10 districts in the South Coast. Estuary that is formed after the flood is now forming a new coastline in White Sand, District Lengayang. About 50 meters from the original shoreline, already filled with sea water and forcing road traffic diverted west Sumatra from its original path. Tide that was eventually flooded the neighborhoods around the Kampar River estuary, with a height of 70 centimeters in less than 5 minutes. Meranti Bay Subdistrict, were submerged. Most of the motor vehicle at the scene, trapped water. The incident also makes people wonder. Tidal wave attacks so quickly is unprecedented. The Zetas have long predicted that the US military would bring their troops home, to the homeland, when the Earth changes picked up, leaving only a skeleton crew at bases over seas. ZetaTalk Prediction 10/11/2003: The war games discussed during the NATO exercises included disasters equivalent to those we have predicted for the pole shift, immense devastation sparing none. In the event that such a scenario ensues, increasing volcanic eruption, quake torn roads and crumbling cities, mass populations homeless and roving the countryside, how should treaties installing the US Military in bases around the world be viewed? In the event of such earth changes, troops would be brought home, under stealth and with little fanfare, to the respective homelands, leaving at most a skeleton crew at the bases. Of the hundreds of thousand of troops Bush had assigned to Iraq, to secure the oil fields for the Bush family and friends, only 150 will remain, a skeleton crew. As of early May 2004, there are some 250,000 soldiers, sailors, airmen, Marines, and Coast Guardsmen deployed in support of combat, peacekeeping, and deterrence operations. This figure does not include those forces normally present in Germany, Italy, the United Kingdom or Japan. If one were to include these forces the number of deployed troops worldwide would be around 350,000. Note the Zetas made the prediction about the troops coming home when Bush, with all his ambitions, was still in the White House, and still pressing for yet more troops for the Middle East, to sit on the fields of black gold there, the oil fields. This shows that the Zetas knew in 2003 when the troops would be returned home, clearly not when Bush was in charge. It would be at a time when the Earth changes would be picking up. ZetaTalk Comment 9/8/2007: Bush intends to stall, as he has in the past, hoping now to push any determination to the spring. What he hopes for is some breakthrough on the many fronts where he has been trying to incite a war with Iran, martial law within the US, and some sort of fantasy about the world finally embracing him as the ruler of the new world. Bush's delusional plans are not even remotely possible or sustainable.